Since the University at Albany’s beginnings as the New York State Normal College, Minerva, the Roman goddess of wisdom has been the institution’s enduring symbol. The figure of Minerva and the Latin motto, Sapientia et sua et docendi causa ("Wisdom both for its own sake and for the sake of teaching") have appeared on the University seal since about 1913. Today, Minerva, wearing her distinctive helmet, continues to symbolize the University's proud past and long-standing reputation for educational excellence. 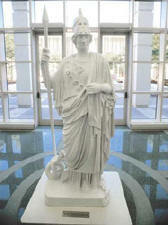 UAlbany's seven-foot-plus white plaster statue of Minerva was purchased in 1888. While there is no official record of where she came from, remembrances have it that the statue was purchased with funds from a $1 student fee collected for make-up exams. The Minerva statue was originally located at 88 Willett St. in Albany when the University was the New York State Normal College. In 1906, when a devastating fire broke out in the college’s administrative offices, a brave custodian, Charles Wurtham, rescued the statue from the burning building. 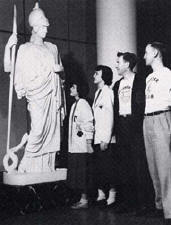 Minerva assumed her new home in the rotunda of Draper Hall when UAlbany was the State College for Teachers. For more than six decades she was a popular meeting place for students. "Meetcha at Minnie" was a favorite phrase and her photograph appeared frequently in UAlbany yearbooks. In January 1962, UAlbany’s Minerva achieved national fame when an article about the teacher’s college appeared in an issue of the Saturday Review and she was pictured on the cover. In 1966, as a gift to the University, the senior Class of 1967 moved the statue from the downtown campus to the new main campus and paid for her refurbishment. The Class named themselves the "Guardians of Minerva." In 1987 Minerva was rededicated and today graces the lobby of the New Library.